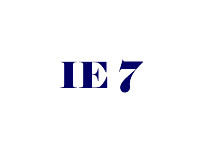 Well IE 7 has hit the general population…. and to my great surprise most of our work seems to be ok. Phew! The strategy of sticking very closely to standards, using CSS which makes a whole bunch of sense on paper actually seems to be working in the real world…. Microsoft following standards? Seems like it. (Other developer colleagues have reported big problems, but we have not yet seen these sorts of issues…..) Fingers crossed. Sticking to standards should be obvious to all, but people still seem to glaze over and not bother. I think that avoiding standards and accessibility has to be a very short term strategy. A bit like taking a shot gun to your foot. With one of our clients we have been working on developing pages for mobile devices. When you think just how many mobile devices there are out there and they are only going to increase…… A good solution is to create your pages to follow the standards and then you actually find that making your site work on mobile devices is soooo much easier as you have already done most of the work…..